In my personal desert island larder (you know, What would you take if you had to choose only a dozen or so dishes or ingredients on a desert island for the rest of your life?) Skordalia with Parsley Salad would surely rate shelf space. * And not because it includes potatoes. But because it includes evoo and vinegar and sometimes walnuts or almonds. And garlic, raw garlic. Call me a brute, but skordalia is about the raw garlic, and a little about the oil. The other stuff runs a distant third. For lovers of garlic, skordalia is ambrosia. The garlic-garlicky etymology comes from a theory that identifies skordalia as a pleonastic compound (hey! wake up!). You already know about pleonastic compounds, you just don’t know you know. A pleonasm is a word made out of two words that mean the same thing, or when one of the terms repeats part of the meaning of the other term. “True fact” is a pleonasm, “tuna fish” is another; “evil Voldemort” is a third (okay, now YOU go). And the words in skordalia? Skordos–Greek for “garlic,” and agliata–Italian for “garlicky.” Hence, garlic-garlicky. Pretty pleonastic, right? In case some smart aleck ever wonders aloud how the Greek skordos and the Italian agliata ever crashed into each other, you might remind him that Venice once ruled much of the Mediterranean, including Cyprus, Crete and much of modern coastal Greece. Greeks consider skordalia a sauce, perhaps because it is so often served with batter-fried fish, and because sometimes they skip the potatoes or bread entirely, maybe adding just a few pulverized nuts to help bulk up the evoo-garlic combination. I have a tough time wrapping my head around anything so thick it can be plated with an ice-cream scoop as a sauce. But that’s just me, because while we generally make skordalia and some kind of small sharp salad to go with grilled swordfish, we always make enough for leftovers. In the following few days we polish off the leftover skordalia, alone (okay, with a refresher salad), and I have no trouble wrapping my head around that. *as would roast duck, white truffle risotto, kimchi, shiitake mushrooms, and local seafood; I’m afraid there wouldn’t be room for beef. You: Hey! You’re choosing finished dishes with lots of ingredients! Me: That’s right. My island, my larder, my rules. You want to count parsley as a single choice on YOUR island, be my guest. **I am indebted to British food writer Alan Davidson and his amazing and entertaining PENGUIN COMPANION TO FOOD (2002, The Penguin Group, New York) for the “garlic-garlicky” story. ½ cup + 2 tablespoons extra virgin olive oil, use a fruity bold-flavored oil. I prefer Greek for this recipe. 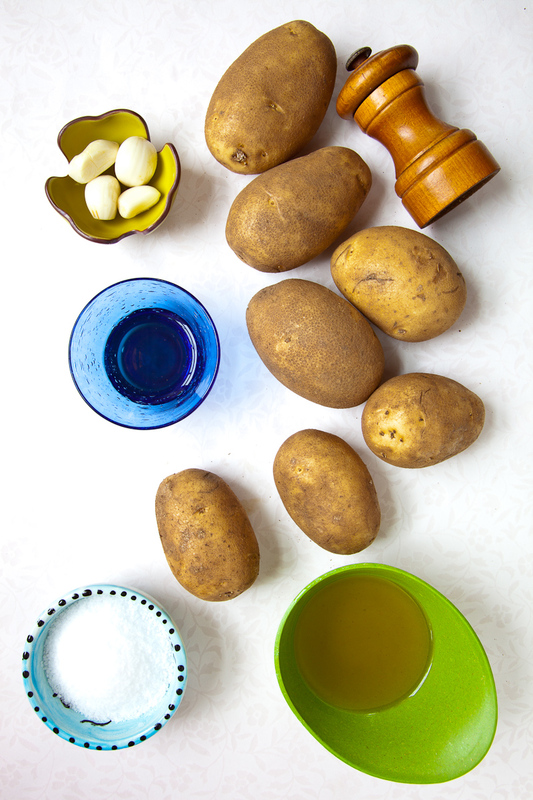 Put the potatoes in a saucepan, cover with cold water by one inch, season with salt and bring to a boil. Reduce heat and simmer until the potatoes are tender, about 20 minutes. Be careful not to overcook them or they will become waterlogged. Drain, return the potatoes to the pan over medium heat and cook, tossing and mashing until the potatoes are dry, about 5 minutes. 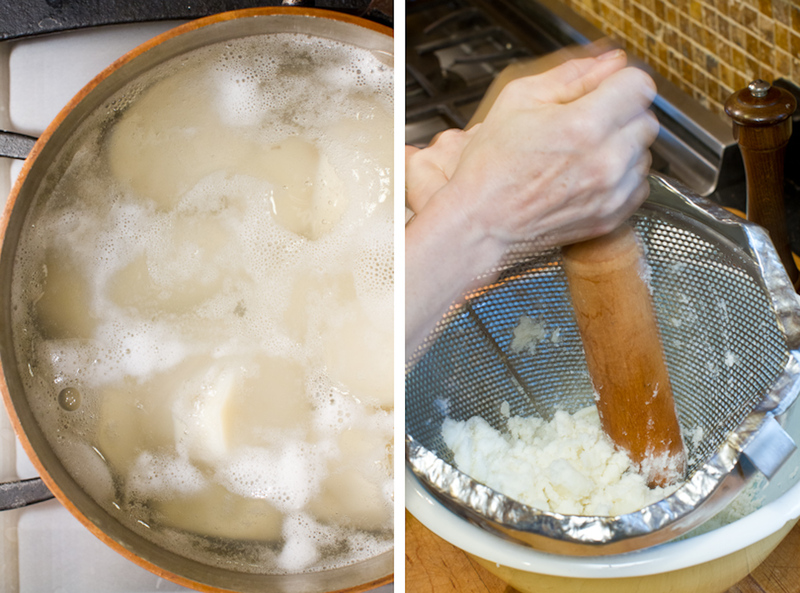 While the potatoes are still warm, push them through a ricer or large-holed strainer into a large bowl. (Don’t let them cool or they’ll be too gummy to push through the ricer.) Beat in the garlic and the olive oil. Add the vinegar, season with salt and pepper to taste. 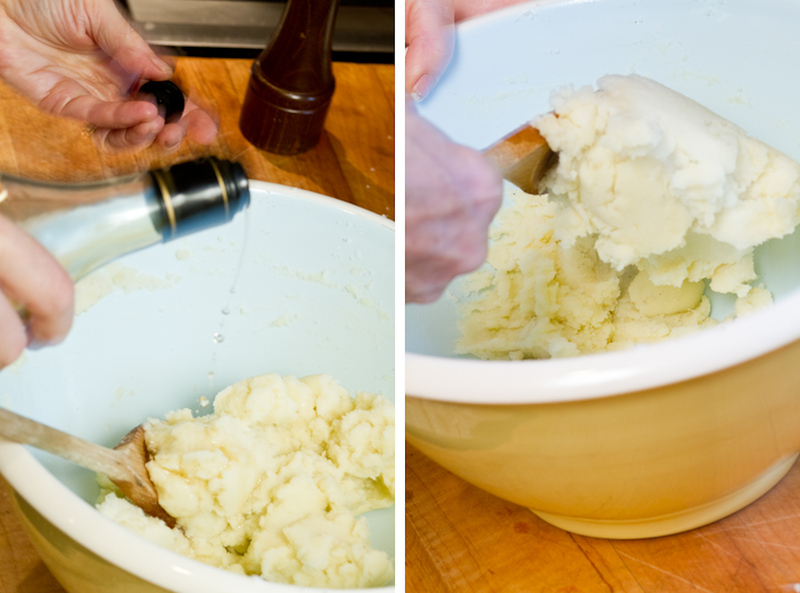 You may want to add more vinegar or more oil, depending on the intensity of all the ingredients and you personal taste. It should be a bold slightly acidic mixture. Serve warm or at room temperature topped with the salad. 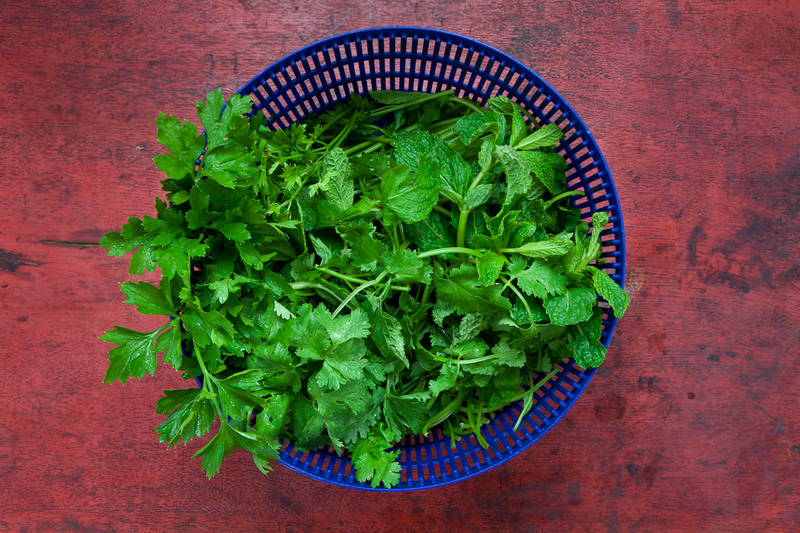 If the herb leaves are large, tear them up a bit, or chop if you prefer. 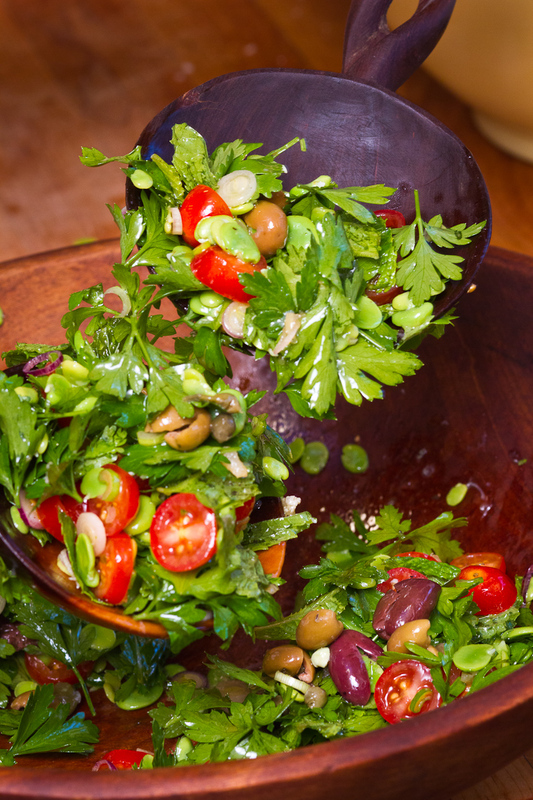 In a large bowl, toss all of the salad ingredients together. Taste and season with salt and pepper. This is best if it sits for 15 minutes before serving. It gives the flavors time to meld and the herb leaves to soften. Is it a sauce? Is it a condiment? In its homeland this Greek dish blurs the distinction between sauce and condiment, between condiment and side dish, between hot and room-temperature food. 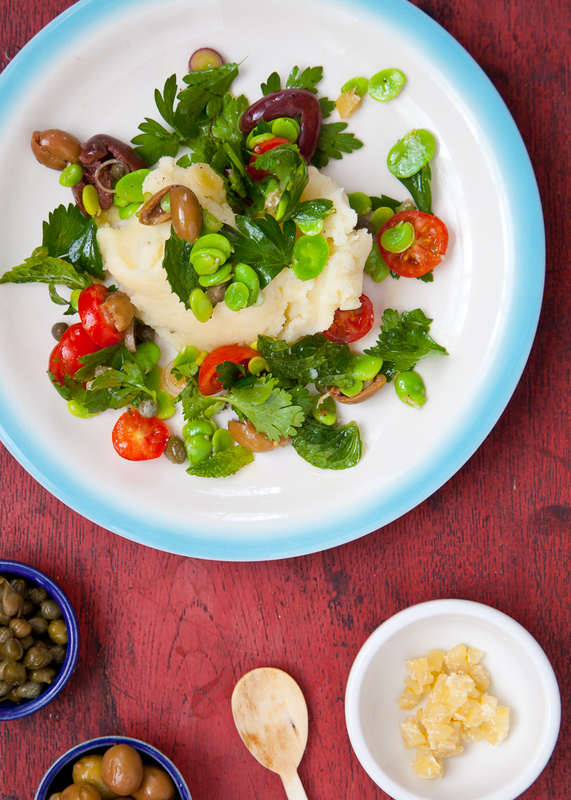 Whatever skordalia may be, it is much more than mashed potatoes. The dominant flavors are of potato, olive oil, raw garlic and vinegar; the combination is at once sensual and primitive. Just in case you thought you’d save yourself some time by using a food processor for this recipe—don’t. The potatoes will turn gummy, instead of remaining starchy, and the garlic will taste too strong (yes, Ken, it is possible to have too much garlic). Regarding the salad, I can already hear the complaints about the favas. They’re hard to find! They’re expensive! They’re labor-intensive! All true. But I love them to death, I use them every chance I get, and and since fresh favas have a short season I don’t mind all the shelling and peeling. If you don’t share my enthuisaim favas, edamame or thin green beans both make fine substitutions. 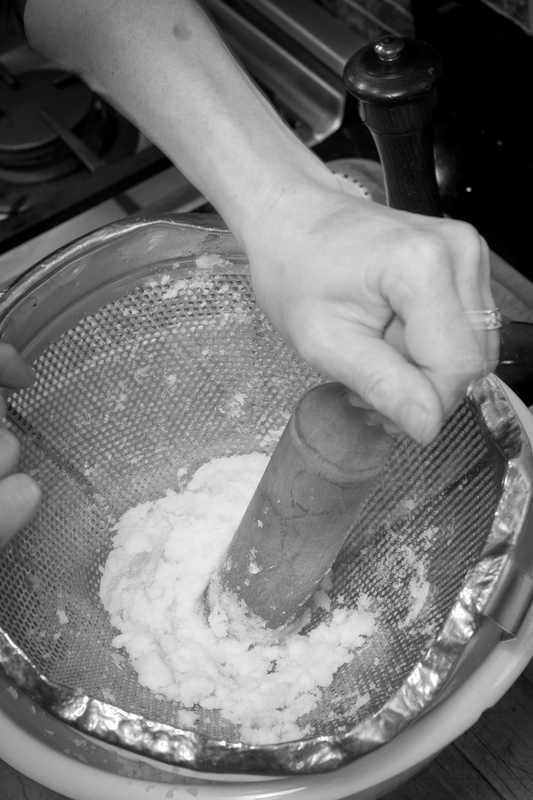 Or you could skip the bean component altogether and add a handful of chopped walnuts. The salad will still be great. I spent a fair amount of time fidgeting on the day I made this while Ken figured out how to maximize the watery gray light from the downpour outside. It’s become kind of running joke in our house: Are we blogging today? Yup. Then be sure to take an umbrella. In any event I decided to take advantage of the idle moments by working a few calisthenics into my culinary efforts. I puffed out 20 push-ups as the favas were blanching, followed by a set each of squat-thrusts and lunges while the potatoes simmered. Then, instead of using a ricer or food mill on the cooked potatoes, I pounded them through a China cap (you can see it in the picture below). I’m sure all of these efforts earned me a skip on the heavy bag during one of my tri-weekly boxing workouts. . . and the right to eat a small bowl of skordalia and parsley salad when I got home from the restaurant late that night. 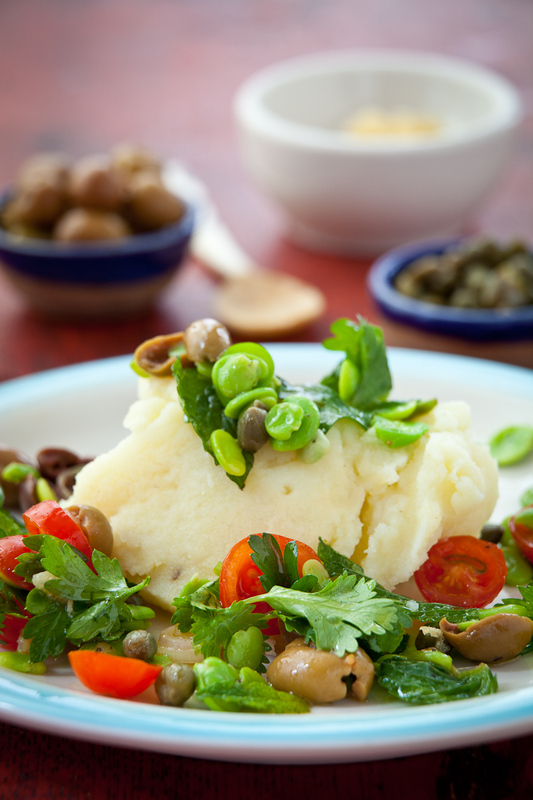 This entry was posted in Easy, Gluten-free, Lunch, Side dish, Vegan, Vegetarian and tagged capers, cilantro, evoo, fava beans, garlic, mint, olives, parsley, Potatoes, preserved lemon, salad, skordalia, tomatoes. Bookmark the permalink. Mount Fujiyama – I understand ‘yama’ is mountain in Japanese. Your turn. Would ‘I personally myself’ be a treonasm? I actually gasped when I saw the title of this post. There was a Greek place near my college campus which is where I first discovered MY FAVORITE FOOD IN THE WORLD. Seriously. I rate Greek restaurants based on if they serve skordalia. In case you were wondering: the best in town is Esperia Grill in Brighton Center. Honorable mention goes to Desfina near the Cambridgeside Galleria. Don’t even bother with Aegean in Watertown who only even gets a mention because they serve theirs with an assortment of fried veggies. Oleana’s celery root skordalia, of course, needs to at least be mentioned. About 6 years ago I scored a recipe from a Greek co-worker. Good, not great. The chances of me leaving work early to make this recipe are pretty high. (Don’t tell my boss.) Yes, to whining about fava beans, so thanks for the substitution suggestions. I don’t have any preserved lemon on hand, so I might bail on that ingredient, too. Oh man, you have no idea how excited I am. While I appreciated learning about pleonastic compounds at 6:00 a.m., I found myself chagrined that I didn’t know what evoo was. How could I have missed this trendy ingredient, I wondered. I laughed after googling it and discovered its true meaning. I’m with Jody. Fava beans would accompany me to my desert island. Preferably shelled my someone else, though I’ve discovered they are a useful tool in engaging recalcitrant teens. You can learn a lot while shelling a few pounds of these green goddesses. No sarcasm at all. Just laughing at myself for being so sleepy that evoo tripped me up. I repeat, you should write history books. You make history (and food) come alive. Looks amazing and such gorgeous photos! So: I was all inspired by the first few chapters of The Everlasting Meal and boiled up potatoes last night, which I never do. 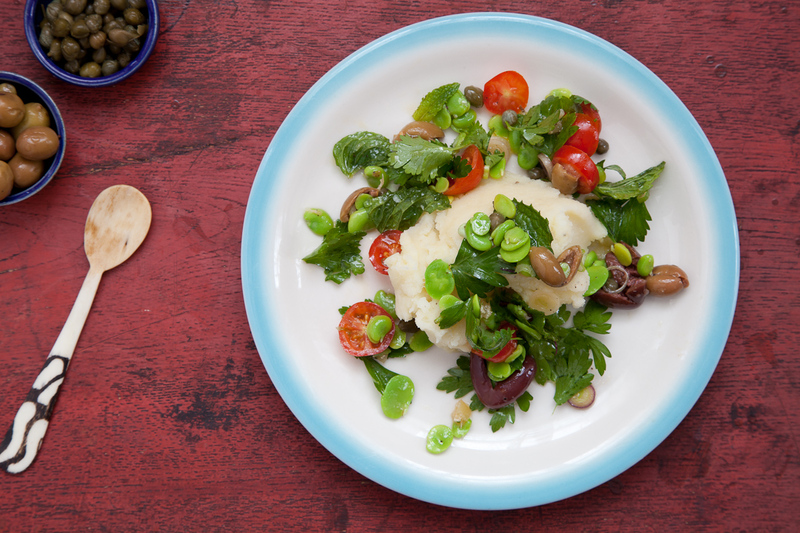 So a “potato salad version” of this is getting made (I see I should not have cooled them). I will see this as my practice in the run up to a fava bean version: I planted favas this spring and they are coming up nicely–but it will be a little while yet I have heard of skordalia but prior to this post I wouldn’t have been able to tell you what it was (and potatoes would have been my last guess, who knows why). But I love it already from the name alone! I also think you shouldn’t count local seafood against your island total under the argument that it’s really already there. 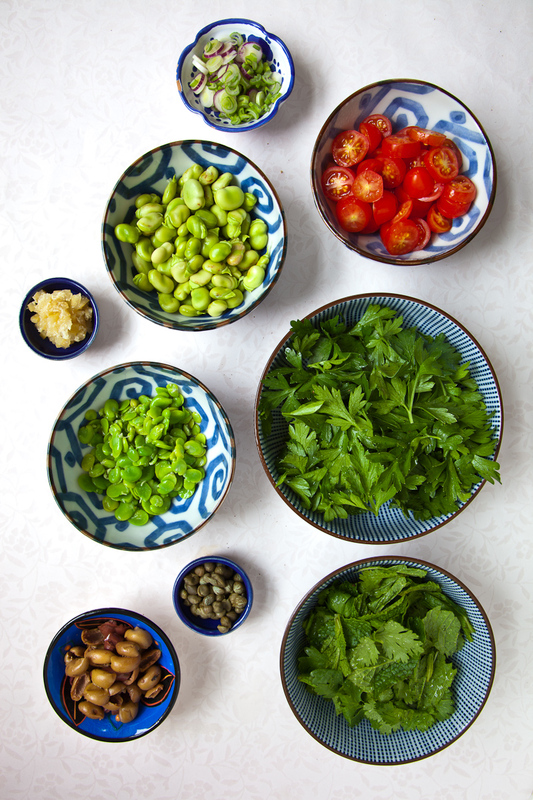 Oh, my, those favas look grand (and the skordalia too). Looks so fresh and delicious and beautiful photos too! I had never heard of skordalia before I read your post yesterday, and then, oddly enough, I was watching a repeat of Iron Chef America last night – Battle Octopus – and saw Michael Symon make the Greek version with bread and almonds (not odd that he made the Greek version, just coincidental that I heard of it twice in the same day). Chef Symon topped it with grilled baby octopus and the judges loved it (although he did end up losing to Gavin Kaysen). Honestly, I would order it in a restaurant but I probably wouldn’t make it at home, mostly because it isn’t readily available where I live but also because I’m a little too squeamish to clean those little suckers myself. I’d still love to see you and Jody do an octopus post though, and I bet plenty of your readers are adventurous enough to give it a go. As for the new blog platform, there were a few tense hours during the transition but everything actually went quite smoothly. Now I’m looking for a new theme with the design options I want. Once that’s done, I’m planning to do a post about the whole process. Oohhh…this has meatless Monday written all over it. have never heard of skordalia before, but garlic-garlicky sounds like my kind of dish. Love how the color pops in your photos, Ken…really nice.